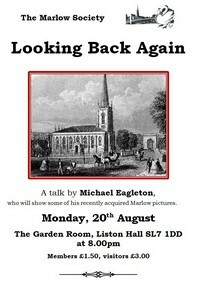 An active group within the Marlow Society is the Local History Group. 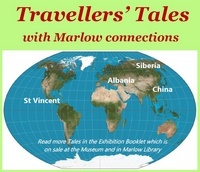 Researching, producing history articles, conducting guided walks and answering questions about the history of Marlow and the surrounding area are some examples of what they do. Read more about the Local History Group. 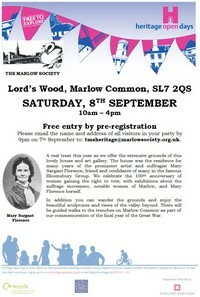 The Marlow Remembers World War 1 website has moved here ( was at www.marlowww1.org.uk ). All displays, information etc. 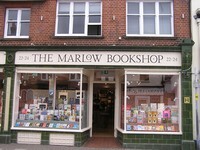 are now in the Marlow History section of this website. The British Association for Local History - www.balh.org.uk - has selected the Marlow Remembers WW1 Association as the winner of the 2019 Research and Publication Award for the article and display: From Beer to Bombs. These publications can be viewed in this section. - Last year's concerns: Unitary authority, Public access to traditionally available areas, Parking. - New concerns: Flood management, Bridge. - Advances in Marlow in the last year: Public realm improvements, Air Quality Management Area, Conservation, Heritage Open Day. 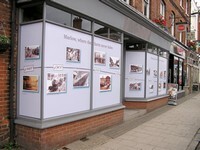 - Society Plans: Member volunteers, Digitalisation, History Boards. - Points to Share: Restoring the Rights. The GDPR (General Data Protection Regulation) is a European Union legal instrument ensuring the protection of individuals with regard to the processing of personal data. The GDPR policy of the Marlow Society can be found here. Please help us stay in contact by emailing tmschair@marlowsociety.org.uk with the message &apos;GDPR. I/We agree to the Marlow Society holding my/our personal details.&apos;, followed by your name(s). 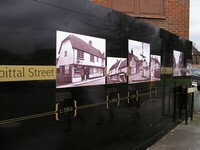 Events by groups other than the Local History Group (LHG) are annotated with (oth). AIM = Archaeology in Marlow, MAS = Marlow Archaeology. The protection and maintenance of Marlow&apos;s beautiful bridge is an ongoing challenge - preventing overweight vehicles, while keeping the bridge an open and practical route for local traffic. visit page ... This page notes some of the thoughts on how to achieve this and some of the specific events and issues that help illustrate the situation. Parking Meters in Marlow: There has been an intention to put parking meters on town centre parking bays that are currently free to park on for a short stay. The Global Business Park management organisation ran a public consultation on suggested improvements to the A404/Marlow roundabout (Westhorpe Interchange). The consultation ran to 1st Feb 2019. With much regret we reported the death of Diana Wethered, a Vice President of our Society. A memorial service took place on 17 December 2018 at 1400h in All Saints Church. The restoration work on the Obelisk was completed September 2018. During the restoration, some elements that worsened the decay were discovered: when the gravel around the plinth had been removed, this showed that water seeping through the gravel had been retained and thus created a pool from which water 'wicked' up the plinth encouraging the spalling we have seen. visit page for more information, along with the original May 2016 report and August and October 2017 updates. (22 Aug 16 but still valid) Soon after the Marlow Bookshop opened in Spittal Street I visited to say, on behalf of the Society, how much I appreciated the new shop's façade and, in particular, the high quality signwriting on the shop sign. 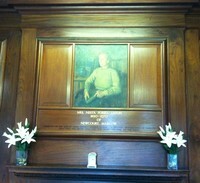 The picture of Nesta Liston, which had been in New Court House since its gift to the town and until its sale to the private sector, is now installed in Liston Hall. Select image to visit page. 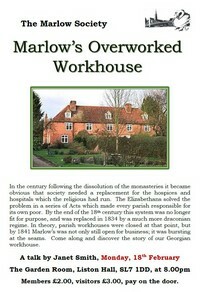 These are two examples, in recent years, of co-operation between the Society and the major property owner in Marlow. We will seek other similar opportunities whilst strictly maintaining our independence. Marlow Remembers WW1 held one of its last graveside commemorations to remember Albert Langdon on 23rd February 2019. He died of pneumonia after extensive war service 100 years ago. His family came from Wales and the family&apos;s homes in Marlow included The Elms in Portlands and Portlands Villas, when his father was the postmaster in Marlow. He had brothers and sisters, and other surnames connected with the family are Mitchell and Plowman, all possibly in the Wycombe or Reading area. Albert's grave is in the graveyard of what was Holy Trinity Church.